Considered to be one of the best family friendly festivals in the UK: with its laid back atmosphere, wide range of music, comedy, literature and workshops over 3 days, and set beneath the idyllic Prestbury Hills. It has been my absolute pleasure to be involved with helping to shape the festival’s brand and develop a website with the clear aim of producing a user experience which is simple and enlightening. We engaged Colin to look at our various entertainment sites, and to help with making them deliver content more professionally across the multiple platforms our customers use to learn about our events. We were incredibly impressed with Colin’s knowledge in a continuously evolving market place. Colin's delivery was very punctual, and his attention to detail an added bonus. We’ve very much enjoyed working with Colin, and he has helped us to up our game dramatically. I also developed an app called Backstage to assist with the management and presentation of the festival’s 100+ performer and activities entries. 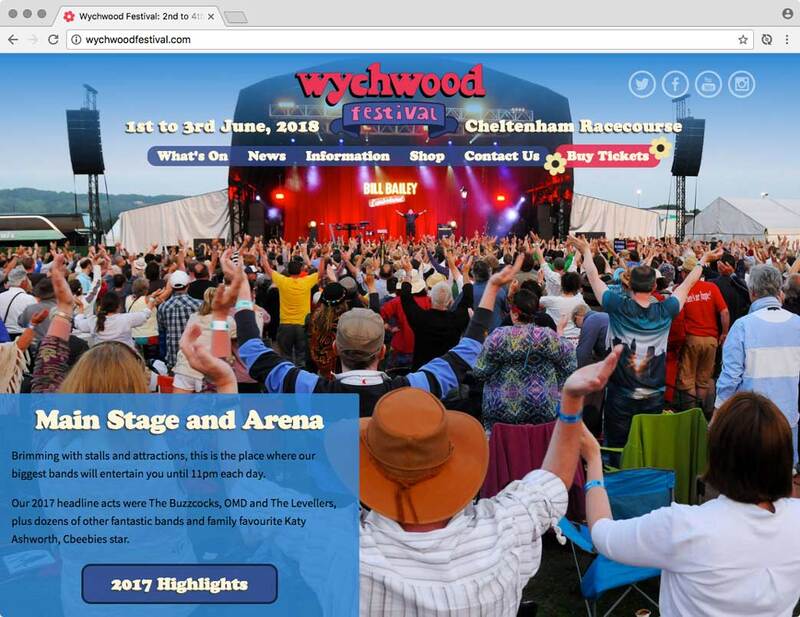 Have a play with the live and interactive view below or go straight to the Wychwood Festival website.